These bits from Rockler are tough and clean cutting. Used normally there is no reason that these bits won't last a very long time. Using edging to conceal the layers within veneer plywood can also make a budget-conscious project appear more costly. But, if you do not get the edging properly aligned with the plywood field the results can look amateurish. The good news is that Rockler has easy to use router bits that make this precision process much easier. Better yet, you don’t need to buy additional task-specific equipment. 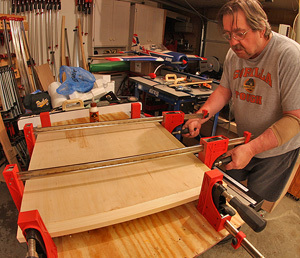 All that is needed is a good router and router table. 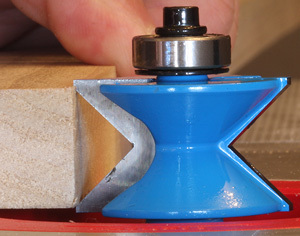 The concave V-bit (left) is adjusted so that the upper and lower edges contact the corners of the wood at the same time. The convex V-bit (right) is most easily set by drawing this bracket with a combination square and then aiming the point of the bit centered between them. You can get dead on perfect with this setup! Both of the V-groove profiles feature K10 and K20 grade carbide for clean, long lasting cutting edges. Final sharpening is done with 600 - 800 grit diamond wheels to insure durable sharpness. These bits also sport a baked-on anti-stick coating that reduces the buildup of pitch and resin found in all wood species. Finally these bits are precision balanced to eliminate vibrations to promote smooth operation. The #40363 and #40365 Edge V-Groove Bits are designed for a maximum 1/2''-thick wood. The #40362 and #40368 bit are designed for wood with a maximum ¾”-thickness. Because of the profile you can also use these bits on somewhat thinner wood. This can be important if you are milling your own wood or just want to use slightly thinner wood to achieve the look desired. Setting up virtually any profiled router bit can be challenging but the shape of these bits actually makes this an easier task. The V-shaped concave bit (#40368 & #40365) is easiest because you simply adjust the bit height so that both the upper and lower cutting edges touch the wood at the same time. All you have to do is make sure that the stock has a square edge, as it should anyway. The convex bits (#40362 & #40363) can also be easy to set to the perfect height using the point of the cutting edge as an indicator. I found that it is much easier to use a combination square to draw marks from the top and bottom of the wood to bracket the center than it is to actually hit the exact center of the woods thickness. If you get the upper and lower lines relatively close to each other you can then adjust the bit height until the point is centered between those two lines. Focusing on this small area is far easier than trying to eyeball or even measure the exact center of the full wood thickness. This process is also way harder to explain in print than it is to demonstrate so see the video below! Both of these bits have bearings (left) so setting the front edge of that flush with the fence faces is easy and very accurate. After a dry trial fit I glued the pieces up. (right) nothing was needed but a final sanding after the glue set up. Finally, both bit profiles have guide bearings that make adjusting the fence easy as well. Set the fence so that the faces are flush with the bearing surface and you are ready to go. I use my combination square for this also, laying the blade across the faces and moving the fence back until the blade of the square is contacting both faces and the bearing at the same time. 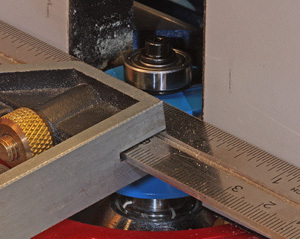 Actually making the edging cuts is no different from with other bit profiles. Take your time, use a moderate feed rate to let the bit do its job and keep your fingers safe! Remember that we are removing quite a bit of wood with these bits so that will mean slowing the feed rate a bit more than what we use with some less aggressive bit profiles. I always cut the profiles in the edging material before making cuts like mitering the edging wood. That gives you a full-depth fit so you can fit the corners accurately to get the best appearance possible. Attaching the edging wood with these profiles is also easier because it is self-centering. Plus because of the greatly expanded glue surface produced by this joint, mechanical fasteners are not needed. Just apply a good film of glue to both pieces and clamp in place until dry. Then you are ready for final sanding and finishing! Edge banding plywood is a very common in any woodworking shop. The Rockler Edge V-Groove Bits make this job easy and produce very clean mating surfaces. These are high quality bits that will last a long time. 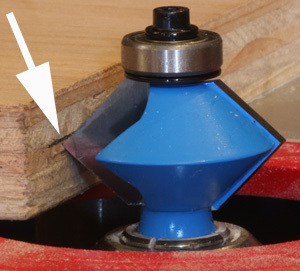 Because this process is common to so many project types the average woodworker will get lots of use from the Rockler Edge V-Groove Bits which makes them a worthwhile investment. 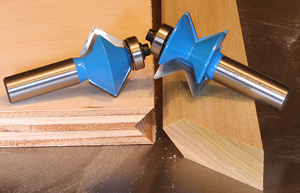 The Rockler Edge V-Groove Bits (Online only) carry a very reasonable price tag as well. (5-6-2013) The #40363 1/2'' Edge V-Groove Bit, 1/2'' Shank (Convex) sells for $31.79 each. The # 40365 1/2'' Edge V-Groove Bit, 1/2'' Shank (Concave) cost $34.49 each. The #40362 3/4'' Edge V-Groove Bit, 1/2'' Shank (Convex) cost $39.99 each and the #40368 3/4'' Edge V-Groove Bit, 1/2'' Shank (Concave) sells for $42.99 each.